Everyone stored in your Wild Apricot database is a contact. A contact may be a member of your organization, but doesn't have to be. Instead, a contact could be a donor or event attendee without necessarily being a member. 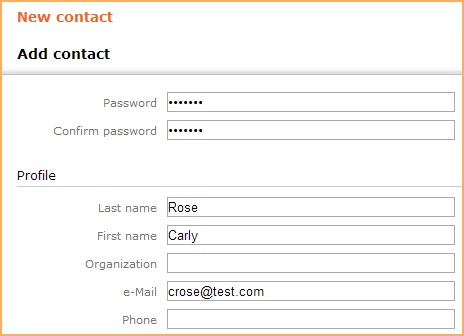 There are several different ways you can add contacts to your database. If an existing contact completes one of these forms using the email address stored on file for them, another contact record will not be created. Instead, the details of the new transaction will be added to the existing record. Under the Contacts menu, select List. On the next screen, fill out the contact's details. In the password fields, you can assign a password to the contact. You must fill in at least one of these fields: First name, Last name, Organization, Email. If you want to store more information about contacts, you can add your own common fields. The contact is now added to your contacts list. When you add a contact manually, an email with their password is not automatically sent. You can email the password to the contact by clicking the Email new password button from the Login details section of the Contact details tab on their contact record. If you don't assign or email a password to the contact, they can click the Forgot password link on your site's login form to receive an email with a link to reset their password. 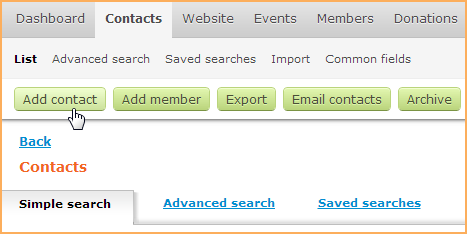 To make the contact a member, click the contact within your contacts list, then click the Membership tab. From the Membership tab, click the Assign membership button. On the other contact details tabs, you can view and modify other contact details.